There are four basic methods you can use to add URL to Google. The first method is to wait until Google finds your new page. The second method of adding URL to Google is to submit it manually. The third method is to add your sitemap to Google. The fourth method to add URL to Google is to do so through AdWords. Now let's explain the details. The first and most common method in how to add URL to Google is to wait until Google finds your web site or your new web page. 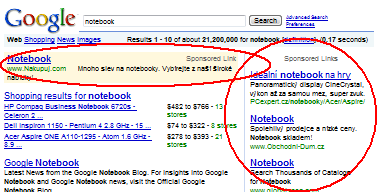 Google works by following links and finding who is linked to whom. Google uses powerful servers to run so-called Googlebots (crawling robots) that crawl through the Internet. Googlebot sees a link at some web page that links to you and follows that link to you. That is how Google finds your web site. Once this happens, your web site or web page will be included in the Google index that is used to supply search results displayed when you do Google search. This is demonstrated by the green ellipse in the print screen below. There is however one inherent problem with this method. For this method to work, your web site or your new web page must be linked to. If you are new, or if your web page is new, it can take a long time before someone finds you and links to you. Enter the URL for your home page or the page that you want to get indexed. Include the http in your URL. Use the Comments box to provide keywords related to your content. Find the best keywords for your web site and list them in the comment section. This method assumes that you already have an account with Google Webmaster Tools. If that is the case, you can tell Google about your new web pages by submitting your new or updated web site sitemap. This is described in greater detail here: How to create a Google sitemap. Google AdWords is a suite that you can use to promote your web site or web page on the search engine results page and also on network member's sites. 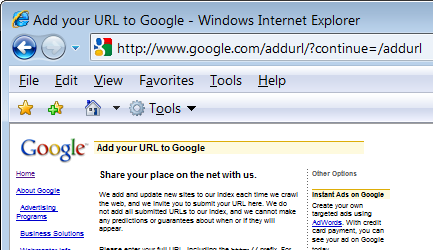 The picture above relates to the method of how to add URL to Google through paid listings through the AdWords program. How long does it take to add URL to Google? The addition of your URL to Google is highly unpredictable. It can take from one day to months. Google states that to spider your site and to add URL to Google can take up to 6 weeks. Usually, adding URL to Google takes only a few days, but it can also take much longer. Large web sites with many inbound links get crawled by Google often, small unknown web sites require weeks. When I add URL to Google, will it be indexed? When you add URL to Google, it does not mean it will be included in Google index. Google can refuse to index your page or site if it does not comply with their terms and conditions. You are also welcome to visit our discussion forum should you have any questions.